Impeach . . . Now!!! Posted on May 20, 2008 | Comments Off on Impeach . . . Now!!! It has been more than 7 years of abuse by this administration. More than 7 years that has included an illegal war, torture, insanely and suspiciously high oil prices, illegal wire tapping, outing of a covert CIA agent, many unethical if not illegal practices, an abusive use of cronyism, elimination of civil liberties and Habeas Corpus, using fear against the American people to achieve political goals, excessive use of wedge issues to distract and divide the American people and so on. I have only scratched the surface of the abuses of power brought on by this administration. Just as reprehensible is the complicit nature of the Congress and the corporate media. Anyone who disagrees with or challenges the policies of this administration are relentlessly smeared by the administration and amazingly also by the media. To be called unpatriotic solely because you voice your disagreement with your government is disgraceful. The call for impeachment can actually be found in the first official document representing the United States of America. 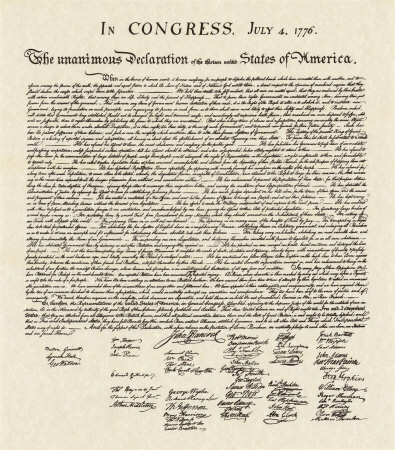 By briefly reviewing the Declaration of Independence as scribed by Thomas Jefferson and signed by the founding fathers of this great nation it is clear that they would have taken issue with this 43rd president and his minions and would have insisted that Congress impeach. It is also clear that they would have taken offense at the current Speaker of the House, Nancy Pelosi who has repeatedly bellowed that impeachment is off the table. Read on to see some of the examples Thomas Jefferson listed in the Declaration that applies to today.